At Our Creative Corner there are some spaces for some new DT members. So we are doing a DT call....Would you like to be a Designer at the OCC? 1. I run the OCC in 6 month terms. If you were to join us, you would begin in January 2015. The minimum commitment is for 6 months - You would have the option to stay on for a further 6 months in June 2015. 2. The DT members provide one piece of work per month. They upload a picture of it for the OCC along with a small piece of writing and they must feature a post about how it was made on their own blog. We don't 'do' just one style of crafting at OCC - and because of this you should be willing to step out of your comfort zone and attempt a new style occasionally. So is being part of the Our Creative Corner Design Team something you would be interested in? If so then please send us an email with a link to your blog......and you might be here with us in January! 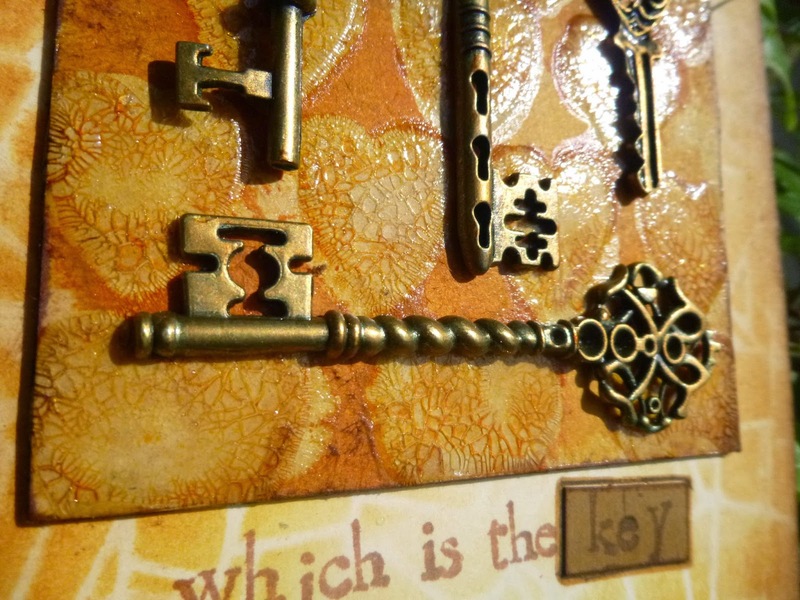 Claudia here to show you a project I made using some of the stuff Linda offers at her fab store, like Tim Holtz stamp sets, Claudine Hellmuth matte medium and Ranger products (crackle paint, archival ink, Distress markers, Distress inks). As there is only one more week until Halloween, I decided to create a selfmade tombstone frame showcasing some of the adorable "Carved Halloween" stamps from the new Tim Holtz collection which I fell in love with at first sight! - Distress crackle paint "weathered wood"
- Distress paint "black soot"
Most of the stuff is available at Linda's Funkie Junkie Boutique - so have fun creating your own tombstone frames! 1. On a piece of corrugated card sketch the irregular shape of a tombstone and cut out using a carpet knife or scalpel. The height of my tombstone frame is about 28 inches and the width measures 7 inches at its widest (which is on the base). Freehand cut out the inner part so you get your frame. There's no need to work very neatly - the more irregular our frame looks, the better! 2. Lay your frame onto some thin cardstock and draw around its shape. Cut out and glue behind your frame using double sided sticky tape in some areas. As you can see I flipped my tombstone frame over as I liked it better this way. 3. Stamp two sheets of yellowed paper with the stamps from the Reflections stamp set using black jet archival ink and let dry. 4. Stamp the labels stamp from the Poisonous stamp set and cut out the single labels. 5. Tear the two stamped text sheets to stripes (one horizontally and one vertically). 6. Using the matte medium and your torn paper strips cover your tombstone frame working from the outside to the inside. Make sure you glue the overlap securely to the back of your frame. When glueing on the paper pieces, cover some of the areas on top with random strokes of the matte medium but do NOT cover the whole surface!!! We want the matte medium brush strokes to build a resist that will become visible with one of the following steps! 7. The last layer to glue on are the poison labels.Let dry. 8. Apply some weathered wood Distress crackle paint with a palette knife. Let dry. 9. Once it has all dried work in some black soot Distress ink with the blending tool. Then wipe off the excess with a baby wipe. As we covered only some of the areas with the matte medium, the black soot ink will seep into those areas that are still uncovered. Wiping over these areas "activates" the distress ink and darkens it, whereas it will take away the distress ink from those areas that resist (due to the matte medium). Also the reverse letters from the "reflections" stamps don't draw too much attention to them as they become more of a texture than text (which was why I decided to use them instead of normal script stamps). 10. Repeat this step using "peeled paint" Distress ink this time. Wipe off any excess on top of the crackled areas using a baby wipe. Let dry. 12. Stamp your images onto some white cardstock using archival ink. Colour with Distress markers. Then cut out. 13. Glue your cut out images in place using sticky foam pads. Blend a piece of white cardstock with Distress inks peeled paint and black soot and stamp your quote onto it. 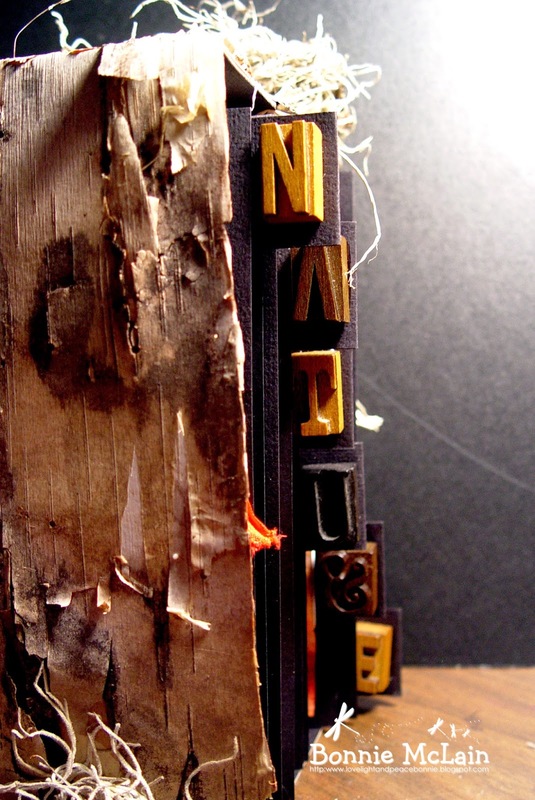 Cut out single word panels and glue in place using the matte medium. See the difference that makes? To help the cut out stamped images blend in I outlined some of the glued on panels and labels with the white Sharpie. It is just a tiny detail but does the trick on holding all the elements together. 15. Stamp the spider image onto a piece of acetate, let dry and cut out. Glue behind the top panel and fix that to your frame with sticky foam pads. The irregular shape of the top panel is the result of tearing it to shape instead of cutting. I coloured my spider from the back using a white Sharpie so it became more visible. So that's my tombstone frame with a lot of messy and "carved" Tim Holtz goodness on it! I would really like to encourage you on cutting your own shapes and having your "traces of the handmade and therefore irregular and imperfect" become a visible part of your artwork! It adds such a lot of depth and personality to your creations! And it also is what makes your pieces inimatable one of a kind originals! This month we are shining the spotlight on the winner of the 'Summertime' Challenge that was hosted by me! 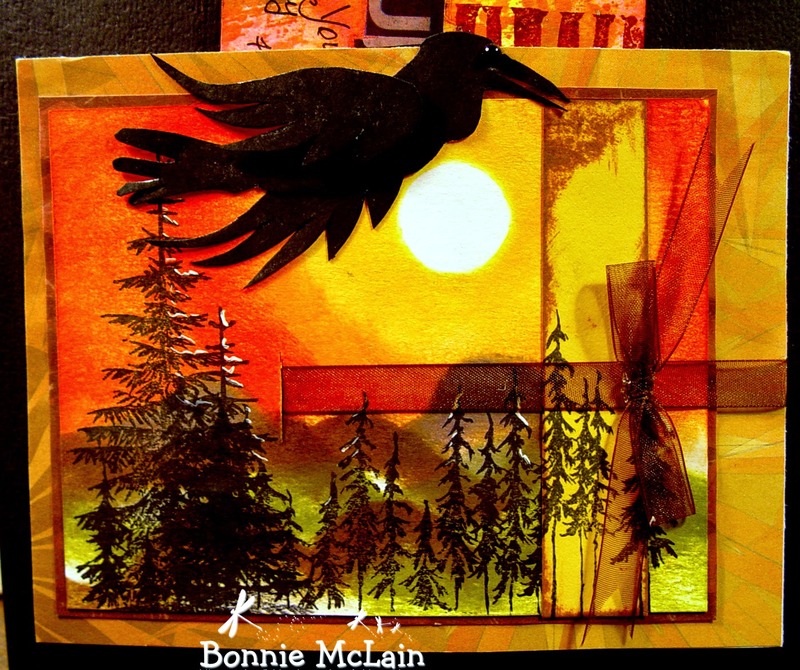 Our Creative Corner is so pleased to be welcoming Bonnie as this months Top Talent!!! 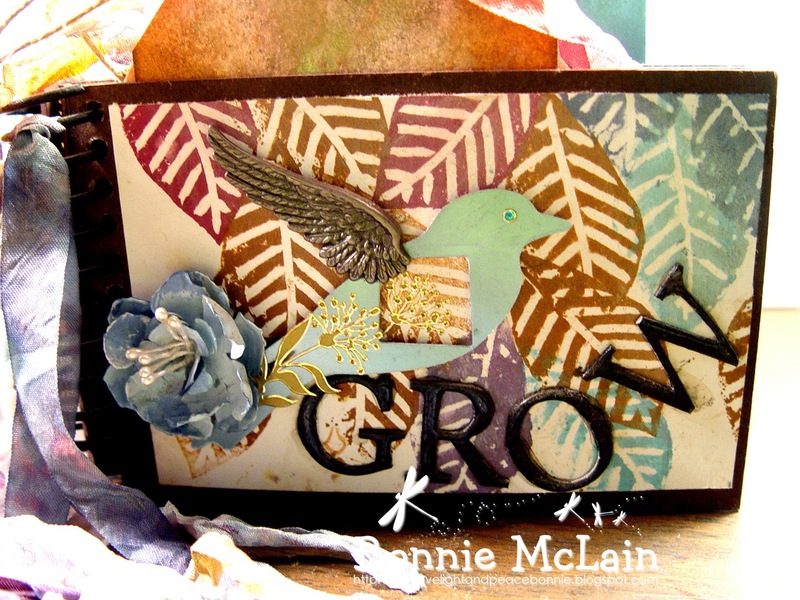 Bonnie has just become a second time winner here at Our Creative Corner. 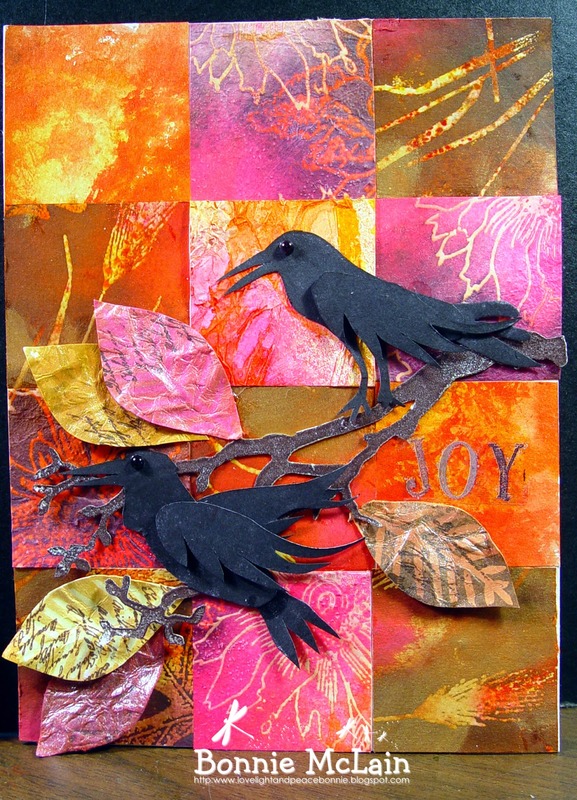 She won Claudia's Autumnal inspiration Challenge - so you will see her here again next month! COLORFUL, and sometimes a little WILD… as I love it when I can get wild with things… Art should be FREE… and to be free you need to let go of all inhibitions… that is art… my art.. I also love to draw, paint, Do Zentangle, create with paper. I use to produce a line of silver wrapped jewelry that I sold wholesale, and created a whole line of special purses and beaded bags. I love to make books, scrapping and also creative books… I have published over 18 books of my art; two being collaged cookbooks and 16 or so of my doodles and drawings. So many of the things I love in my home are things that I love to create, like a huge basket collection… so I had to learn how to make baskets too when I was a teenager… and so I teach basket making of different fibers. 3. Please tell us about any items in your craft stash that you can't be without? - What is your favourite 'must have' item for crafting? and also lets not forget some ink pads… LOL..
.......did I hear you say ONE ITEM??? 4. What three things do you think of most each day? 1.What we are going to eat for the day to keep our bodies nourished and in good health… we are very aware of keeping our body in the best health possible. That is body, mind and spirit…. it is first thing on our list every day… Meditate, plan meals and do chores is the first order of the day. 3. This might sound funny… but the next thing of priority is “What colors are needed to be used… to bring this about…” As I stated color is very important in my art… and my life… I love color… In my art and my blogging, I try to send love to all people in need of LOVE… and I do that off and on all day long… I love people… people in my daily life are no different than my blog land friends, or anyone else… I love them all.. and respect their feelings. So I do think of people all day long. 5. How do you spend your time when not crafting? 6. Do you have any personal goals you have attained or would like to attain in the future? The future… I would love to spend more time with our grandsons… one lives in NJ… one in NC… and would love to have the family all back together in one area… attainable???? You never know… but I am putting this out to the universe and maybe it will happen… magic and miracles do happen. 7. Any inspirational words you can share? Always make sure that your “TO DO” list is very long… and that you always have something else ready to start, when what you are working on is done.. Always be ready to enjoy and live each and every second of your life to the fullest. And do it all in full LOVE from your HEART CENTER. I have been on Design Teams in the past, also recently have been a Guest Designer on quite a few different challenges, but I have to say that this one has been the one with the most FREEDOM to create as I do....I have had a lot of fun making this project. 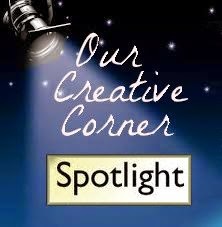 ....now it is time to shine the spotlight on this month's Top Talent creation - let's see what Bonnie made for us! 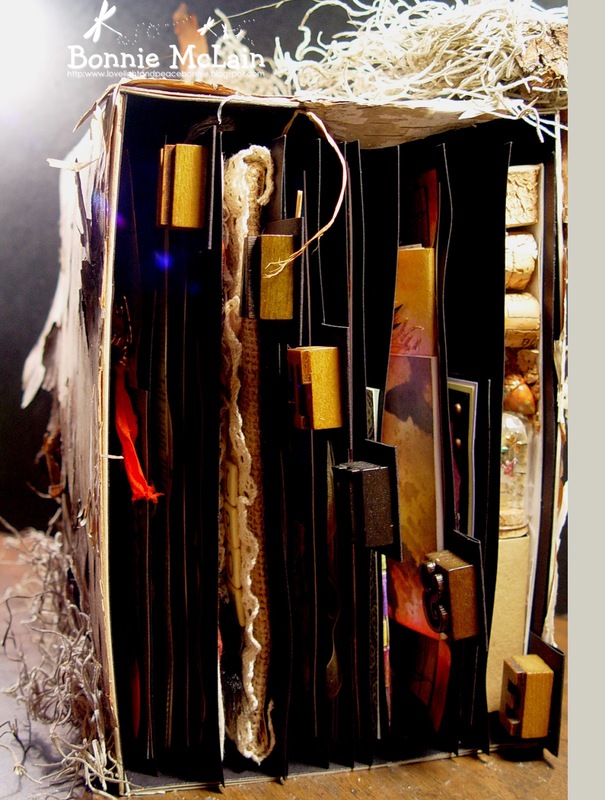 This project started off with being a book... and turned into a box with sections of art work, using a letter from the word NATURE to be the focal point of that particular section. This is one of the sides of the cubbie that holds my art... of course it had to be created in a very special way too... all the sides and top are decorated with nature. This whole project is all about making rubber stamps that suit your needs... I wanted a CROW stamp that was uniquely my own CROW... that would MOVE... and would CROW like things... that is what I did... and also a few more stamps too... and I used lots of techniques through out the entire project. There are six sections... all different in all ways.. This is just so amazing Bonnie! So many perfect details and it is obvious that you have put your heart into every part of this....Your work is always so wonderful and so very unique. 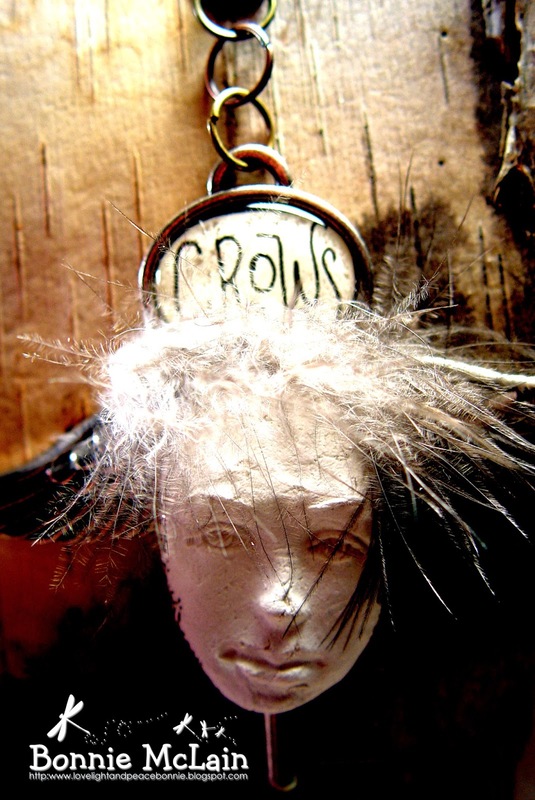 It is such an honour to feature this gorgeous creation at Our Creative Corner. If you want to see more photos and details of this wonderful creation and find out how it was made, then please go along to Bonnie's blog and say "Hello" - I am sure she would love to see you there! 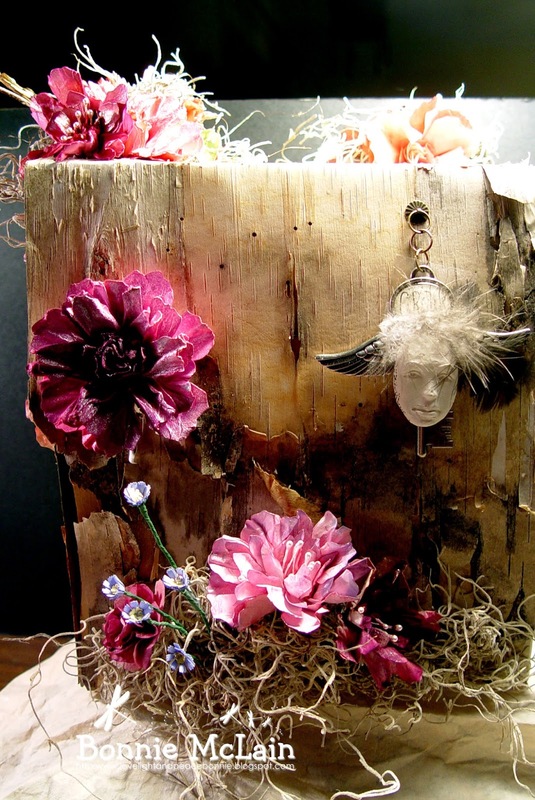 There is one more week of the Go-Rustic challenge left, so why not have fun creating! You have gotta be in it to win it! Hello everyone, Alison here. 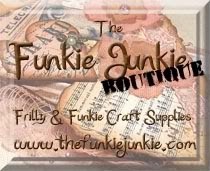 I'm delighted to offer up the second Sponsor Spotlight of October, highlighting our fabulous sponsor this month, The Funkie Junkie Boutique. There's a $25 gift voucher at the Funkie Junkie Boutique on offer as the prize - so come and play along with our Go Rust-ic! challenge theme. I love The Funkie Junkie Boutique. As well as fantastic prices on products from Ranger and Tim Holtz, and lots of other great companies too, Linda Coughlin (a.k.a. the Funkie Junkie herself) also has a whole range of really funkie (of course) vintage charms and fabrics and other goodies that you don't find everywhere. I started with a tea-stained tag, and used the Tim Holtz Shatter Stencil, blending through some Wild Honey and Rusty Hinge Distress Inks. Over that I applied some Wendy Vecchi Translucent Embossing Paste through the Hearts Stencil. Once that was dry, I repositioned the Hearts and applied some of the Crackled Texture Paste over the top. Once dry and crackly, I used Distress Stains in the same colours to create the depth of colour and highlight the crackles. Having not quite lined up the stencil in exactly the same place, the Distress Stains seeped into the card in some places and met the resist of the translucent paste in others. And, being liquid, they also occasionally seeped under the crackle. I really love the imperfections caused - more than happy to embrace the look! The shatter pattern underneath disappeared slightly, but I decided to mount the whole thing on a jumbo tag using the same stencil. As well as the Wild Honey and Rusty Hinge, there's also some Vintage Photo and Spiced Marmalade involved in the background tag. I spent some time arranging the keys to please the eye. Some of them have had a little touch of Florentine Gold Treasure Gold just to warm up the colour tone in order to complement the inks. …and there's a great variation in sizes - something for every project! With all that shattered stencilling and the cracked hearts, the sentiment just bubbled up. I used Distress Stains to dye some Seam Binding for the topping, and secured it with some rustic raffia. So that's my Funkie Junkie tag for you. Claudia will be here later in the month with Sponsor Spotlight No.3, and if you missed Laura's amazing Dylusions tutorial, check it out here. Don't forget to check out this month's challenge to be in with a chance of winning the $25 gift voucher for The Funkie Junkie Boutique. 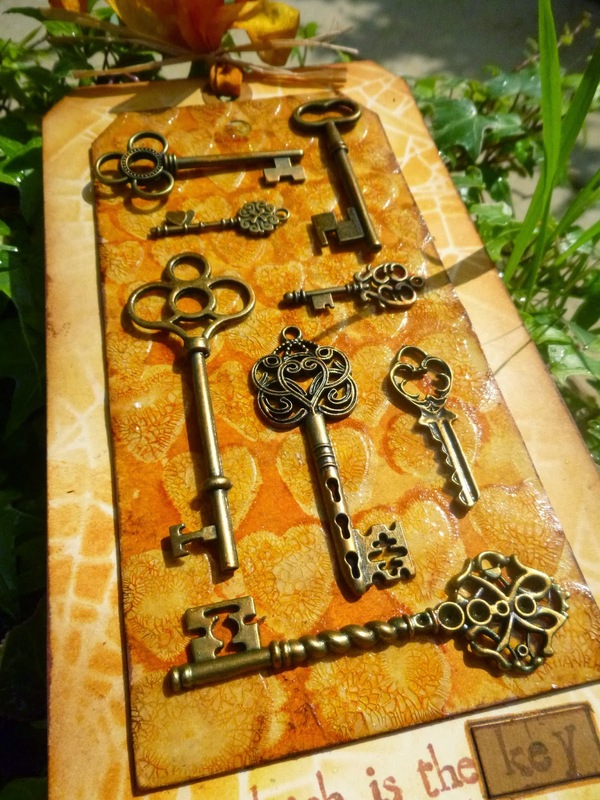 We are Going Rust-ic this month - so get out those rusty shades of ink and paint, or show us your favourite faux-rust technique. Perhaps you might like to show us some real rust! No matter how rusty you are, we would love to see your rusty creations.